Among the young disciples of Sri Ramakrishna, Swami Vivekananda, or Narendranath Datta, as he was known in his premonastic life, was the most prominent. After the passing away of the Master, he collected together the younger disciples and formed a small monastic brotherhood with a monastery at Barranagore which was shifted later to Alambazar and then finally to Belur (a few kilometres north of Calcutta, on the west bank of the Ganges). With these as their permanent centres, they wandered —as monks in India traditionally do— throughout the length and breadth of India, enduring great hardships and extreme poverty in the name of God, meeting in the process, people belonging to different strata of society. Swami Vivekananda himself, after leading a peripatetic life for about six years, decided to proceed to America to represent Hinduism at the Parliament of Religions, which was scheduled to be held at Chicago in September 1893 as part of the World Fair. He felt that his countrymen, who were immersed in poverty and ignorance, could be awakened only when their ancient heritage was appreciated in the advanced western countries. His other aim was to unite the East and the West through the ancient Indian message of the unity of all creation. His successful presentation of Hinduism at the Parliament of Religions, his whirlwind lecture-tours in the West, his triumphal return to India in 1897, and the great national awakening that followed are now part of history. The work of the Ramakrishna Math and the Ramakrishna Mission, begun by Swami Vivekananda in 1897, with Belur Math as the headquarters, has steadily grown in volume, and the number of centres has multiplied. There are now 118 branches in different parts of India and abroad, devoted mostly to the ideals of contemplative life and social service. The Math and Mission have their own hospitals, dispensaries, colleges, high schools, students' homes, orphanages, libraries, and publishing houses. They also carry on philanthropic, cultural, and spiritual works. They have been consistently active in rendering help to the victims of earthquakes, floods, famines, epidemics, cyclones, riots, and other such calamities. In short, the guiding motto of the Ramakrishna Order has been, in the words of Swami Vivekananda : 'This is the gist of all worship : to be pure and to do good to others. He who sees Shiva (God) in the poor, in the weak, and in the diseased, really worships Shiva'. Each soul is potentially divine. The goal is to manifest this divine within, by controlling nature, external and internal. Do this either by work, or worship, or psychic control, or philosophy, by one, or more, or all of these, and be free. This is the whole of religion. Doctrines, or dogmas, or rituals, or books, or temples, or forms are but secondary details. If there is a God we must see Him. If there is a soul we must perceive it; otherwise it is better not to believe. It is better to be an outspoken atheist than a hypocrite. Take up one idea. Make that one idea, your life; think of it; dream of it; live on that idea. Let the brain, muscles, nerves, every part of your body be full of that idea, and just leave every other idea alone, This is the way to success, and this is the way great spiritual giants are produced. Those prophets were not unique; they were men as you or I. They were great Yogis. They had gained this super-consciousness, and you and I can get the same. They were not peculiar people. The very fact that one man ever reached that state, proves that it is possible for every man to do so. Not only is it possible, but every man must, eventually, get to that state, and that is religion. The embodiment of freedom, the Master of Nature, is what we call God. You cannot deny Him. No, because you cannot move or live without the idea of freedom. No life will be a failure; there is no such thing as failure in the universe. A hundred times man will hurt himself, a thousand times he will stumble, but in the end he will realise that he is God. Religion is not in doctrines, in dogmas or in intellectual argumentation; it is being and becoming; it is realisation. In studying books we are sometimes deluded into thinking that thereby we are being spiritually helped; but, if we analyse the effect of the study of books on ourselves, we shall find that, at the utmost it is only our intellect that derives profit from such studies, and not the inner spirit. This inadequacy of books to quicken the spiritual growth is the reason why although almost everyone of us can speak most wonderfully on spiritual matters, when it comes to actions and the living of a truly spiritual life, we find ourselves so awfully deficient To quicken the spirit, the impulse must come from another soul. To many, Indian thought, Indian manners, Indian customs, Indian philosophy, Indian literature, are repulsive at the first sight, but let them persevere, let them read, let them become familiar with the great principles underlying these ideas, and it is 99 to 1 that the charm will come over them and fascination will be the result. Chicago Addresses — Addresses at the 1893 Pariliament of Religions in Chicago. The Vedanta Philosophy — Address before the Graduate Philosophical Society, Harvard, 1896. 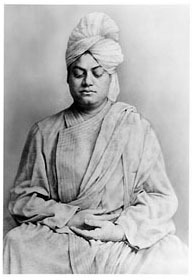 WallStreet Journal Magazine March 29, 2012 — Article about Swami Vivekananda at Chicago 1893 and personalities he met, including Sarah Bernhardt, Nicola Tesla, William James et. al. Discourses on Jnana Yoga — A short introduction. Lessons on Bhakti Yoga — A short introduction. Experience of Nirvikalpa Samadhi — Swami Vivekananda narrates.